TUCSON -- Ashley Moler completed a dominant weekend of handball on Sunday, winning the Women's Classic over Tracy Davis, 21-11, 21-16. Moler not only matched Davis' commanding front court game, she also forced her opponent back with timely defensive shots to the difficult corners of the exhibition court. This play allowed Moler to build leads through both games that Davis ultimately couldn't overcome; although, she did make a late push in the second game before falling short. The win marked the first Women's Classic title for Tucson's Moler. In the WPH R48Pro LTE final, Daniel Cordova stopped David Fink's incredible run in Tucson, winning 15-9, 15-6. Cordova's amazing talent was on full display, showing why he's one of the pro tour's biggest rising stars. Fink held an early lead to open the match, but Cordova immediately answered and kept constant pressure on his opponent. Fink made an exceptional effort to keep the games close, only to have Cordova slam the door with a kill or a will-timed pass. The day was not lost for Fink as he recovered quickly after his pro final to take his first Masters (40-plus) Singles title, defeating Adam Zimet in two games. In other Masters Singles action, Emmett Peixoto took the 35-plus title over Fausto Castro, and Marcos Chavez won the 45-plus crown by defeating Raul Jasso. Chris Tico defeated Ryan Grossenbacher in the 50-plus final. Phil Kirk won the 60-plus title over Lloyd Garcia. Glenn Carden held off Greg Sizemore's rally to win the 65-plus division. Merv Deckert outlasted Ed Campbell in a tiebreaker for the 70-plus crown. Jim Ward topped Jim Smith in the 75-plus final, and Norm Young took home the 80-plus title over Mike Lundy. In Hall of Fame action, two of handball's rising stars won singles titles to add to their growing collection of hardware. David Sanchez III edged Dylan Key in the Men's A final, and Andres Cordova stopped Ashton Steadman in the Men's B division. A special Thank You to all our event sponsors and volunteers. Thank you to the WPH's Dave Vincent and David Fink for their work in bringing the top pros to Tucson for the R48Pro LTE event (read the WPH wrap-up and coverage HERE), and thank you to all the players who traveled to play the best game on the planet: Handball! Next season's Women's Classic will be held in conjunction with the Milwaukee Classic in December. See the draws and final results on the tournament's R2sports site HERE. 2018 Decatur recipient Kelly Albers presents the Marty Decatur Sportsmanship Award to Kristen Hughes. TUCSON -- Saturday's action set the table for an exciting Championship Sunday for all of the divisions in the 25th USHA Hall of Fame event. The day's action wrapped up with a celebration at the USHA Headquarters and Handball Hall of Fame. Kristen Hughes was awarded the 2019 Marty Decatur Sportsmanship Award by last year's recipient Kelly Albers. The award honors the player who exhibits tremendous goodwill on and off the court making the tournament a better experience for anyone they have a chance to meet or play. In the WPH R48Pro LTE, David Fink and Sean Lenning split two somewhat lopsided games in the first semifinal, setting up an exciting tiebreaker decider for the first spot in the final. Lenning continued to zip the ball around the court, keeping Fink off balance with incredible hooks and ball movement on his serve. Fink countered with dazzling athleticism, keeping rallies alive with incredible gets and capitalizing on any mistakes his opponent would offer. Lenning controlled the tiebreaker early, leading 9-5, only to see his lead evaporate as Fink finished the match with a 10-2 scoring run to win, 15-1, 6-15, 15-11. Fink will also play in the Masters Singles final against Adam Zimet. In the other semifinal, brothers Daniel and Luis Cordova put on an amazing match for the fans at the Tucson Racquet Club, showing why they've been two of the tour's top finishers this season. Through two spirited games, Daniel found more scoring opportunities to edge his older sibling, winning 15-11 and 15-11 to face Fink in Sunday's 11 a.m. final. In Women's Classic action, 2017 champion Tracy Davis answered Kristen Hughes' upset bid with a series of passes and kills to advance to the final, 21-9, 21-15. Hughes put together a string of points by engaging Davis in long rallies, hoping to tire the top seed and set up offensive opportunities. Davis not only showed incredible conditioning, she unleashed her powerful service game to finish the match. A rematch of the 2015 Women's Classic final between Ashley Moler and Jennifer Schmitt took place in the other semifinal. Schmitt rolled to a victory that year, and she looked poised to make a return to the this year's final by showing off a solid game that won her numerous national crowns. Moler has shown constant improvement since that tournament, and on Saturday she turned the tables against Schmitt, playing aggressively throughout the match earning a 21-6, 21-17 victory. She'll face Davis in the Women's Classic final. Schmitt and Hughes will battle in the third place match. In the Masters Singles, top seeds ruled the day with the exception of the 55-plus and 80-plus divisions. Steve Roberts of Salt Lake City continued his flawless play, edging top seed Paul Pfannenstiel 21-6, 21-16 to advance to the final where he'll face William Cervantes of Albuquerque. Elsewhere, Mike Lundy (Colorado Springs) edged Ed Grossenbacher in an 11-10 tiebreaker to advance to the 80-plus final. He'll meet Norm Young who also advanced with a tiebreaker win. See the draws and today's results HERE. TUCSON -- The Annual USHA Hall of Fame Event celebrates handball by honoring the game's history and celebrating today's top players. What better way to mark the 25th anniversary of the tournament by featuring the Women's Classic, National Masters Singles and the WPH R48Pro LTE! The atmosphere was electric at the Tucson Racquet Club on Friday as top players battled throughout the day in first and second round action. All the top seeds in the Women's Classic bracket advanced, including Tracy Davis, the 2017 Women's Classic Champ the last time it was held in Tucson. Davis also put on a tremendous show in the Masters, pushing No. 2 seed Raul Jasso through two exciting games before falling 21-19, 21-11. Jeff Streibig (St. Louis) extends for a return against Sean Lenning (Tucson) in the WPH R48Pro LTE. In WPH's R48Pro LTE event, Jeff Streibig of St. Louis put forth a spirited effort against top seed Sean Lenning, almost playing the roll of spoiler on Lenning's home court. Streibig took game one, 15-10 and was up in the second before Lenning stormed back to force a third set by the identical score. While Lenning usually owns the crowd in Tucson, the gallery cheered Streibig's tremendous physical effort and impressive shot execution. Lenning ultimately settled in to advance to the quarterfinals, 10-15, 15-10, 15-5. The rest of the Hall of Fame events resumed on Friday, setting up Saturday semifinals. See the draws with today's results HERE. Tucson's longtime tourney directors Charlie Wicker and Vince San Angelo get an assist from University of Arizona freshman Kena Byrd-Jackson on Thursday afternoon. TUCSON -- The excitement and drama of the WPH R48Pro Tour was on full display for Sunday's finals in The Tucson Memorial. Killian Carroll made his way back to another R48Pro final after falling in the semis in Atlanta. Sean Lenning was looking for some redemption as well after suffering the same fate: being bounced in the semis of that same tournament. Playing in front of a raucous home crowd at the Tucson Racquet Club, Lenning's serve was zipping all over the court as he dominated Carroll in two games, winning the second R48Pro stop of the season, 15-10, 15-7. Carroll found himself in an early hole, trailing 9-1, but he was able to close the gap with some heart-stopping gets and precision kills. But the day belonged to Lenning, as he kept Carroll guessing and off-guard with low drives to the right, and he ultimately slammed the door with a fortuitous right front corner kill. Sunday's final turned out to be that kind of a match for Lenning, while Carroll couldn't catch a break. In the second game, and looking to force a third, Carroll was on the receiving end of an unfortunate bounce which hit his shoe, awarding the rally to Lenning. After that, the momentum was in Lenning's favor, and he rolled to his first R48Pro victory of Season 8. In ladies action, Catriona Casey (swinging above) faced a resurgent Ciana Ni Churraoin, but she was able to hold her late rally off for the victory, needing overtime in the second game to win, 15-7, 16-14. In the Men's R48SRPro final, David Fink stopped Marcos Chavez for the title, 15-2, 15-11. If you missed any of this weekend's action, you can watch the replay at WatchESPN.com or on the Watch ESPN App (iPhone or Android). See the final results and scores on The Tucson Memorial's R2sports site HERE. The WPH put on another incredible show that carried some extra meaning. Players and fans from around the world trekked to Tucson for this $50K "no entry fee" event that paid tribute to our fallen handball friends. Read the WPH wrap-up and report HERE. Dave Fink tracks down a shot off the back wall in semifinal action against Killian Carroll. Killian Carroll overcame a collision with the sidewall at 0-0 and a great performance by David Fink to earn a trip to Sunday's final. After sliding into the wall at 0-0 after making a few great gets, Carroll won the first and was up 9-1 in the second before Fink made a great comeback to win the second. Carroll mounted another 9-1 lead in the third before Fink made another strong effort to get back into contention but Carroll closed it out for the win. Between pro semifinals, Kara Mack explained the Memorial's significance. The WPH Qualifier Draw can make the preliminary rounds exciting and even unpredictable. Unpredictable was indeed the case on Friday, as many players qualified for the first time. In the top qualifier bracket, Richie Fernandez (Juarez, Mexico) toppled Marcos Chavez (Yorba Linda, CA), 25-21 while Tyler Stoffel (Mankato, MN), a collegiate All-American coming off a year of injuries, upended favorite Max Langmack (Springfield, MO), 25-12. In a historic R48Pro first, father and son, Leo Canales Sr. and Leo Canales Jr. (El Paso, TX), qualified for the Pro Draw. They were joined by Stephen Cooney (Ireland), Loren Collado (Orinda, CA), Braulio Ruiz (Tucson) and Abraham Montijo (Tucson). Richie Fernandez (background) waits for Daniel Cordova to track down a ball off the back wall in first round action in the WPH R48Pro Draw. Cordova advanced to the quarterfinals by defeating Fernandez, 15-6, 15-3. The Tucson Memorial and WPH R48Pro VIII Stop #2 boasts the top prize money purse of the year at $50K! While the exciting action of the WPH R48Pro Season 8 resumes at the Tucson Racquet Club, the event honors those in our community who have left us, but also celebrates their lives through the sport we love most. Be sure to catch Sunday's action! Watch LIVE coverage on WatchESPN.com and the WatchESPN App See the WPH Schedule). Follow the draws on the tournament R2sports site HERE. Read the WPH's official Press Release HERE. BROOKLYN, N.Y. -- The 6th Annual Coney Island Players Championship was held In Memory of Michael Schneider Sr. (aka “Papa”), on Sept. 15. In addition to a strong field competing for prize money, many close friends of Papa Schneider were on hand, including Dan Flickstein and Hall of Famers Al Torres and Albert Apuzzi. Tournament directors Jared Vale and Billy O’Donnell presented Mike Schneider Jr. with a plaque honoring his late father. The short presentation included a huge thank you to event sponsor Elliot Joseph, another close friend of Papa whose generous contributions keep this event as a highlight of the summer and to remember our fallen handball family members. After a week of awful weather in NYC, the sun finally came out for a perfect day of handball. The Open Singles division was stacked with 28 of the top one-wall small ball players in the world. The field included current World Champion William Polanco and National Champion Tyree Bastidas. Once again, Tyree Bastidas proved to be the best in class; however his run to the title was met with several close matches. The most notable was tournament MVP Andres Calle, a NYC police officer, who came within one point of upsetting Bastidas in the semifinals. Yuber “Pee Wee” Castro scored a $100 Bounty by taking out Jurell Bastidas 25-17 in one of the most exciting matches of the day. Pee Wee was unable to generate enough energy to take out Tyree in the final, no doubt a victim of reaching the final of two divisions. Castro retired in the final with Tyree leading 9-3. Several open singles competitors also entered the 40+ doubles, making this one of the most competitive Masters divisions in history. Joe Kaplan, Anthony Jones and Eddie Perez joined Pee Wee as competitors in both divisions. It was a hard road to the final, which featured the teams of Jai Ragoo and Cesar Sala against Pee Wee Castro and William Polanco. Ragoo and Sala were able to topple Castro and Polanco after a one-hour match that saw several lead changes. At 14-all, Ragoo stepped up and took control, hitting several rally-ending shots that pushed his team to victory, 25-19. Next year, The 7th Annual Coney Island Players Championship looks to increase the $5,000 purse and attract players from all over the country and the world! Photos taken by Kirk Lewis. MAUMEE, Ohio -- The Labor Day Holiday brought warmer temps creating brutal conditions for players on the Lucas County Rec Center Courts. Temperatures were already reaching the high 80s for the 9 a.m. finals that began the day. The steamy courts didn't slow down the elite players who battled to reach the championship matches on the event's last day. Hillary Rushe won her third consecutive Women's Open Singles championship, defeating Kristen Hughes from Austin, TX in two games, 21-7, 21-12. Rushe would pair with Carly Munson to win the Women's Doubles crown over Hughes and Leah Kirk, 21-15, 21-10. In an all-brother Men's Open Doubles final, Daniel and Luis Cordova, making their first final appearance as partners, outlasted Dane and Adam Szatkowski 21-15, 21-15. No team could match the consistency and fire power of the Cordova duo the entire weekend en route to their doubles crown. In other action, Mark Zamora once again took two titles home on Monday, winning the 55s with Alan Frank and the 50s with Tommy Valenzuela. Richard Solomon won the 65 Singles before taking a 10-year hiatus. This year, Solomon slammed the 75 division, winning with Norm Young on the final day. Once again, the Toledo Handball Club delivered an exceptional event for all the players and families who attended the 68th USHA National Three-Wall Championships. Thank you to all the exceptional volunteers who make this the best overall handball experience each year! MAUMEE, Ohio -- It's getting crowded at the top of the all-time list for Three-Wall Nationals titles. On a September Sunday morning, Sean Lenning tied Vince Munoz by winning his tenth singles crown, defeating Daniel Cordova, 21-15, 21-2. This year's final was vintage Lenning: shoot out to a big lead, then demoralize opponents with serves. In the first game, Lenning strung out a strong 15-1 lead before Cordova could answer. Cordova went on a 15-6 run, but couldn't secure game point. The second game started the same way, but this time Cordova didn't answer. Lenning continued to pile on points until he reached match point for this 10th title. The joy was short-lived as the Cordovas ousted defending champions Marcos Chavez and Lenning in doubles later the same afternoon. The Cordovas play the Szatkowski brothers in an all-sibling final. The doubles final will be played at 9 a.m. local time. In Women's action, Hillary Rushe looks to complete the three-peat bid in the Women's Open. She'll face University of Texas' Kristen Hughes in tomorrow's final. MAUMEE, Ohio -- A late summer heat wave brought higher temperatures to the courts followed by a brief rain delay in the afternoon on Saturday. Play was suspended for a few minutes as the Toledo Handball Grounds Crew sprung into action, drying the courts with a team of propane blowers to continue play. In Men's Open Singles action, Sean Lenning battled Luis Cordova Jr. for a spot in Sunday's final. Lenning was crushing the ball against Cordova, clearly focused on making the final, but his opponent made him work through two tough games before conceding 21-15 and 21-16. Three-wall fans braced for the second semifinal, a match-up between the always exciting Dane Szatkowski and young star Daniel Cordova. Cordova jumped to a quick lead in the first game only to see Szatkowski come back to take a small lead. While Szatkowski looked like the more experienced three-waller, Cordova's youth combined with a nasty serve which hopped out the back of the court, helped him prevail, winning 21-16, 21-12. In other action, Marty Clemens (shown swinging) defeated Mike Fagan for the Veteran's Golden (55-plus) title, 21-12, 21-18. Dr. Dan Zimet cruised to another singles crown, defeating Jim Karner in the Veteran Masters (45-plus) final, 21-6, 21-5. Other title winners include: Mike Driscoll (80-plus), Richard Solomon (75-plus), John Friedrich (65-plus), Casey Mayo (40-plus), and Fernando Alvarez (40B). MAUMEE, Ohio -- The second day of action at the 68th USHA Three-Wall Nationals brought more intense matches in singles divisions and first round play for doubles. In Men's Open Singles quarterfinal action, Luis Cordova Jr. stopped Bill Mehilos in two games, 21-11, 21-15. Cordova plays defending champion Sean Lenning in tomorrow's semifinal at 11 a.m.
Daniel Cordova plays Dane Szatkowski in the other Men's Open semifinal at 12 p.m.
MAUMEE, Ohio -- The Toledo Handball Club proudly hosts the 68th USHA Three-Wall Nationals. The draws and start times are now "live" for the event. Action starts Thursday afternoon at the Lucas County Rec Center's eight regulation courts. 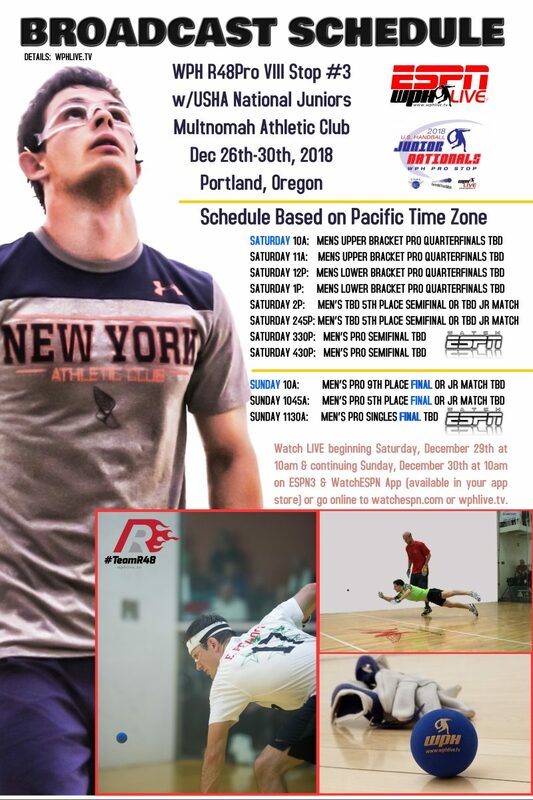 Handball fans will be following the results to see if defending champion Sean Lenning will continue to add to his amazing run in the singles, while teaming with Marcos Chavez to gun for another doubles crown. Tournament registration and check-in begins on Thursday at 11 a.m. Please note: Draws and times may change. Remember to check draws on the day of the event for any updates. See draws on the R2sports tournament page HERE. UPDATE: USHA Board Member and Game Committee Chair Tom Sove will provide a Referee Clinic at the Lucas County Rec Center, Thursday (Aug. 30) at 6:30 p.m. Everyone in attendance will become a Certified Handball Referee (and learn some in-depth insight to the rules!). PHOENIX -- Carl Hayden High School was the site of a combined handball tournament and Mecha Car Show this weekend. Thirty-two players and nearly three dozen classic, souped up and low-rider cars were on campus to wow the fans. This is the second year for the tournament which raises money for the high school handball club. The tourney is planned and managed by the Arizona State University handball team. The Sun Devils are happy to show their commitment to community service and mentoring young student-athletes through this fun event. High school players from Carl Hayden and Camelback participated along with a passel of local adult players. "We're lucky because it's always great weather for outdoor handball," quipped Hayden coach Chris Hogan. "Today was exceptional! A high of 70 degrees and not a cloud in the sky -- not even a gust of wind." The Open division was won by David Munoz over Jim Carkeek. David may have entered the tournament with a slight edge and perhaps as a sentimental favorite. Munoz had graduated from Carl Hayden High School years ago. "This is where it all started for me. It feels great to win this one on the courts where I first learned to play." Then there will be colors that have personal meaning, such as the Teal that’s now part of my daily look. You see, every cancer has a color. Who knew? I didn’t, I Googled it and ended up at ChooseHope.com, one of many websites selling a rainbow of supportive accessories. Most people are aware of pink ribbons for breast cancer, and yellow wrist bands declaring it’s possible to live strong with any cancer. My particular journey with ovarian cancer is represented by teal. There’s even an acronym in the community: Treat Early And Live. Most ovarian cancers are found in the late stages and become very difficult to treat. I’m getting more involved in service to others with cancer and cancer agencies as I approach the one-year anniversary of my surgery on September first. Linked below is the second feature I wrote for the National Ovarian Cancer Coalition (ovarian.org). Read carefully – you might even see the word “handball” in there! And comments from Portland’s Dr. Bob Gill, who is living with gioblastoma. Hanging around the Championship courts in Minnesota, show your loyalties in every way and we’ll share a laugh. I’ll have on some teal, but I have a Team USA red, white and blue pedicure too. Quite enough can happen in just one day. What about 3,175 of them? Almost nine years ago, Jay Maxwell, Tom Hussey and I were preparing for the start of the 2009 World Handball Championships at the Multnomah Athletic Club in Portland, Ore. I emphasize the start because it was a heck of a run-up. A bit like settlers crossing the Great Plains, watching and watching the Rocky Mountains never get any closer, suddenly we were “in the foothills” at last. Now. Oh, good heavens, now! Come to think of it, in autumn 2004, perhaps those lists resembled one another! During that long run-up, complications took root and grew. Waterford Crystal, which provided exquisite signature trophies for the world championships beginning in County Clare in 1994, ceased production. I visited Ireland and met with a very kind former employee at the closed Waterford factory. Noel Power supplied many thousands of dollars of product from remaining stock so Portland 2009 didn’t have to break the tradition of presenting world-class crystal to champions. The MAC leadership changed too. Administrators who in 2004 and ’05 excitedly permitted and supported such a long horizon for a very involved event were gone from the club. Some plans became more complex under new club direction. Additionally, by 2009, many economies had experienced enormous downturns. Global issues impacted daily activities. Yet our committee of 27 chairmen had held the grand vision and love of the event and each other for years. We just kept working. I suppose all of us realized, just then, that we had indeed been holding our collective breath. Ultimately, our efforts created a world championships that welcomed 993 players from 10 countries for 12 days. “The success was attributable to a fantastic facility and an amazing team of volunteers,” Hussey says today. Now all the moving parts of hosting the worlds are back in our country, with the Minneapolis tournament’s needs expanded again by the growth of one very important aspect. One-wall handball changes dramatically each time the event is staged. In 1994 the cheerful and persistent Irish one-wall organizer, Tom O’Connor, called it “the funny games,” and just a wee number of players arrived in County Clare from countries like Finland. A few Eton fives specialists appeared from England with peculiar gloves and strange rules and customs but no shortage of cheer. O’Connor can be proud of that start. By 1997 the Winnipeg worlds committee built two side-by-side outdoor courts for the tournament. Mayor Susan Ann Thompson and host chair Bob Pruden produced a grand opening media event, and the walls were emblazoned with the spectacular and creative 1997 logo, my personal favorite of all time. Later years placed courts inside hockey rinks and gymnasiums, and the construction of multiple courts by Dublin in 2012 was the most visible and central setting for one-wall ever attempted. Anyhow, nine years can make a hell of a difference indeed. I am so glad I’m not in the center! I’ve got other stuff going on, as many of my handball family are aware. Unlike October 2009 (and for years ahead of it), when I ate, slept, wept, sweated and dreamt handball, since September 2017 I’ve had the luxury to put all my energy into well-being and recovery from surgery and chemo for ovarian cancer. I’ve moved into survivorship and am evaluating what the journey has meant and will mean throughout my long life, including the unknowns. But we all have unknowns. This may seem like a grim example, but when I was in treatment I read that a woman who survived the Las Vegas massacre was killed by a drunken driver a month later. Her story gives me a certain strength. I delight in each day because I’ve got a boatload to do, and I’m ready to devote my energy, passion and charisma to new things. As you read this, handballers from every section of our sport will be in Minneapolis cheering friends, family and our U.S. dream team … and I’m not just talking about our great players in one-wall, four-wall and wallball. I’m talking about Steve Johnson and his crew of sponsors, administrators, facility directors, loved ones and everyone making this come together for us. You can cheer at the courts and wave flags and have fun … and please, pat every single one of the hosts on the back as you go by. They’ve earned it! What time is it? I’m journaling with morning coffee so … for Joe Santilli in Australia, it’s the wee hours of morning. Tomorrow. Oh, sweet Joe. At the 2015 World Handball Championships, he gave me a pen, knowing I love writing. When using it, I think about Joe, Donna, and their sons. I hope we’ll all meet up in Minnesota. I know many players who show up at the World Championships with a few simple gifts for friends and friends-to-be. Some are based on long knowledge of the recipient, like my pen; others seem cannily intuitive. At my first World Championships, in Phoenix 1991, a Japanese woman player, Kumiko, presented me with a tiny ceramic white kitty sleeping in a ball. I can’t remember who won our match, but I’ve still got the kitty. As a host committee co-chair in 2009, I was showered with magnificent presents, among them a handsome lacquered box from the Japanese team. Irish friends and administrators brought me a number of lovely gifts, including a buttery-soft violet wool scarf from County Wicklow. Globes were a theme that year. Bill Kelly, who’s shared desks, dinners, laughs and lamentations with me over many years, gave me an incredible globe which spins with light. It rests on an engraved pedestal commemorating the tournament. Another globe came my way from Down Under that year, this one a delicate Swarovski crystal orb from Vic DiLuzio. Luxurious customized gifts are not necessary, of course. But bringing along a few goodies is fun and meaningful, often many years after the tournament. Some “gifts” can be shared more than exchanged. I pick up a few picture postcards of my hometown – and Portland, not lacking anything for scenery, has a lot choose from – to show new tournament friends where I hail from. Another way to create special memories is recycling gear from bursting drawers and closets. Handball t-shirts get exchanged formally at some events and informally at others, and it’s fun to wear the rare ones back at the hometown courts. Many souvenirs are easily tucked in luggage, airport security friendly, and not bulky for new friends to carry home. I can pick up inexpensive Oregon-themed buttons, magnets, keyrings, luggage tags and bookmarks nearly everywhere. In addition, some products are both portable and boldly local: Oregon Rain lip balms are going in my bag, and a few lightweight wooden Christmas ornaments, from Made in Oregon stores. Journaling with Joe’s gift reminds me that, as I’m preparing for my 10th World Handball Championships, it’s time to pack more than clothes and cosmetics. In Minneapolis, I’ll be ready to present and receive small tokens of enduring friendships with my extended handball family. Travel safely, and see you there!